Truth by Kbaig: Secret Agencies of World Indulged in Terrorism in Pakistan & ISI Facing Them Alone! Secret Agencies of World Indulged in Terrorism in Pakistan & ISI Facing Them Alone! In drone attacks in FATA (Federally Administered Tribal Area) the supporters and members of Al-Qaeda (a terrorists wing of CIA used for justifying American aggression) are targeted who are busy in planning to harm Americans, but the reports of deaths of innocent people (they are not innocent because they are not ready to treason against Pakistan and join US terrorists) are baseless. 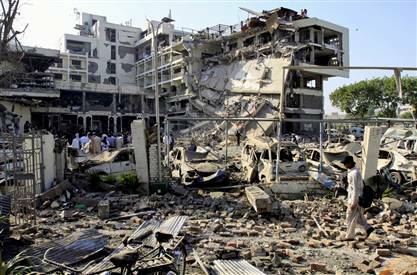 the attacks in Pakistan has been targeted over those areas where access of Pakistan army was not possible. Now pay attention to the contradicting justifications of US President. On the one hand he says that drone attacks are conducted in those areas where Pakistan army has no access due to the terrain conditions but he could not answer that in such an area what type of latest communication and military operations rooms are available to these terrorists utilizing which they can plan and attack the world’s most developed nation involved with weapons of mass destruction to humanity and where he has been able to prove that those killed in drone attacks were planning to attack USA. (The truth is that Americans are never killed in attacks by external terrorists but they are targeted in CIA terrorist plans). 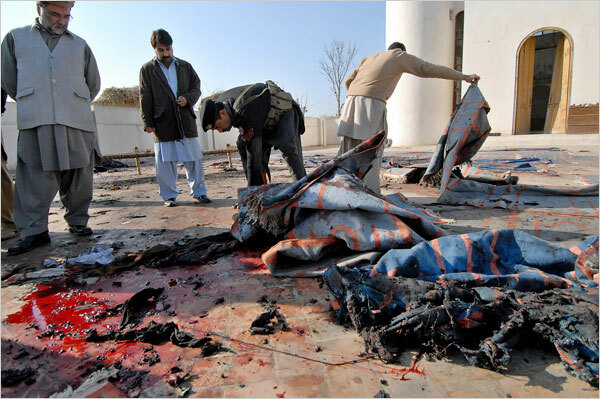 Before taking support of lies Obama should have verified that houses destroyed in US aerial terrorism were not situated in barren lands but in the towns/villages of tribal areas where hundreds of innocent women, children and elderly has become target of US lust for blood during attacks over selected houses (usually houses of those tribal elders who are active in restoration of peace in those areas and have agreed to support security agencies against terrorists). Moreover Mr. Obama should have answered the question of a US women about the numbers of total terrorists and innocents killed in US aerial terrorism. He should have also informed US public that how many new terrorists and psychics willing for suicide attacks have been created by US aerial terrorism. He should also make this clear that whether he will allow Pakistan to conduct operation in USA, and Europe against traitors and masterminds of terrorism who are guest of these countries? 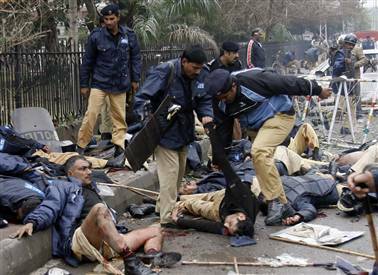 If we look at the terrorist activities during just last one month, than on 5 January dead bodies of 16 FC personnel were recovered from Spintull canal. These personnel were kidnapped by terrorists during attack over FC check-post on 23 December in the district Tank. On 9 January dead bodies of 10 more persons were recovered from Upper-Orakzai who were kidnapped from Kumber. On the bus stand of Jamrood Bazar 35 innocents were killed and 40 others injured in a remote bomb attack. Here this should be kept in mind that this bus stand belongs to Jamrood tribe who has established army for restoration of peace and against terrorists in support of Pak-Army. In an attack over convoy of FC 14 persons were martyred, the reports disclosed that these terrorists had ambushed FC convoy. This is another aspect that on 14 January USA expressed concerns over situation of human rights in Baluchistan. However USA (United Satanic Alliance) did not dare to answer that in those areas where there is no coverage for even mobile phones, than how does these terrorists belonging to BLA or whatever they name it track the movement of FC convoys and coordinate with their trained gorillas equipped with latest US weapons through Satellite phones? The attacks over FC posts on 1 February were conducted in the same manners as they use to attack security forces in FATA. The borders of both areas are adjacent with Afghanistan, in both areas similar latest weapons are used, in both areas the trained commandoes equipped with latest weapons target Pak-Army and security forces along with other important personalities, so what does all this prove? Where did the footprints of terrorism lead us? The only difference is that whether these are videos of killing security persons through torture or slaughtering them, neither USA is concerned with it, nor our TV channels or so called US sponsored human rights activists and NGO’s. No one raises this point that why only Pakistani soldiers are being murdered through torture or slaughtering, why US and allied soldiers arrested in Afghanistan do not face same fate in the hands of Taliban? However if these NGO’s, TV Channels or so-called liberals (devoid of all morals) can be observed proactive if they are given chance to criticize Pakistan army and ISI. Anchorpersons try to prove themselves as Aristotle of media by criticizing Pakistan army over slaughter and deaths of soldiers. Criticizing Pakistani security forces have now become a fashion. If any one wants to prove him/herself as moderate, enlightened and educated, there is no need for any tempered degree or diploma, just start own security forces without any evidence and not only one will get fame, wealth but certificate of being liberal as well. Most astonishing fact is that those anchor persons of Pakistan who earned name through writing books in favor of Afghan Jihad during the reign of General Zia supporting the position Pakistan army now criticize Pakistan army for its afghan policy and claim that the terrorism of present time is gift of Zia’s policies, and over this they complain that some people call them as agents of RAW or CIA. Perhaps they do not remember the article of Carl Bernstein linked with ‘Washington Post’ published in 1977 consisting of 25,000 words under the title of, “The CIA and the Media”. In this article he proved that many respected and famous journalists are serving CIA undercover to support plans of CIA. Although I do not want to allege anyone but in the way the propaganda of killing of four terrorists under custody of secret agencies is going as soon as Hussein Haqqani has left Pakistan after permission from Supreme Court, it seems that in contrast with 40,000 innocent persons killed in terrorist attacks these terrorists who were caught red handed were more innocent and humans (perhaps these propagandists are not ready to accept Pakistanis as human beings). I does not mean to favor state agencies for extra judicial killings, but in the way Asma Jahangir and Hasil Bazanju criticized ISI and Army in a talk-show for missing people I wish few persons from those families affected by terrorism should have been invited in this talk-show and they should have been inquired that how they are fulfilling their financial needs after death of the only earner for the family. Is there future safe or not due to no means for earnings? These anchor persons should have asked that how many times Asma Jahangir and Hasil Bazanju and all others involved in looting in the name of NGO’s for poors of Pakistan had visited their houses. How many anchor persons had courage to visit their houses and record their documentaries to show the world that the war on terror (or in the other words the terror war) which was started by New York in the name of CIA terrorist attack of 9/11, after which USA along with allies attacked Afghanistan and made Pakistan its non-NATO ally through threats and bribes has been now imported into Pakistan by the secret terrorists agencies of these countries. 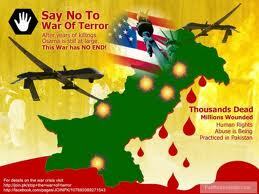 According to US govt. 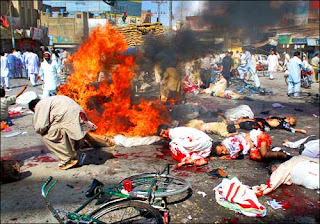 (notorious for lies) at least 2500 people were killed in attacks of 9/11, as revenge only in Pakistan more than 40,000 persons have been killed. The number of deaths in Afghanistan and Iraq are in addition to this. But in spite of so much blood shed and massacre of humanity the thirst of America has not been quenched yet. In spite of genocide of millions USA has failed to assure world of her victory. So now there is only that is the blame ISI and Pakistan for this. USA is of the view that Pakistan army and ISI are behind disgusting defeat of US in Afghanistan. This is why on the one hand USA is struggling for respectful retreat from Afghanistan through talks with Taliban, for who US had invaded Afghanistan ten years ago under the cover of B-52 bombers, daisy cutter bombs and Tomahawk cruise missile blaming them as terrorists through UNO (maid of USA). On the other hand before retreat from Afghanistan USA wants to defame Pakistan army in the eyes of Pakistanis, as Pakistan army and ISI still possess a better position as compared to renowned and modern armies and secret agencies of the world. Whether it is operation against terrorists in Swat or helping flood affectees, Pakistan army has proved that they are ready to give up their lives for service to nation and defense of motherland. As far as deaths of four terrorists in the custody to security agencies is concerned I would like to request Asma Jahangir to go to court in spite of calling our soldiers as “duffer” and expressing her enmity towards defenders of our motherland. If she can defend Haqqani free of cost for her specific goals assigned to her, than she should also represent those terrorists who are indulged in destruction of many innocent families. If she had enough moral courage she should also asks our legislators to amend law so that such back doors in the law should be fixed through which many notorious terrorists are set free in spite of being red handed. As long as the slang language used by Asma and terming Pakistani soldiers as duffers, “those who are ready to give up their lives for few bucks, are not they duffers” is concerned, what about her selling her loyalties to enemy for few dollars? She is correct in saying and using such slang words about defenders of motherland, because due to them we are still free and independent otherwise her supervisor, her boss India would have succeeded in capturing Pakistan and depriving us our freedom long ago. This is due to Pakistan that she is now trying to act as champion of human rights otherwise she should look at India or Indian Held Kashmir that how many women lawyers are like her are living in miserable condition. She may learn from them that what is the value of freedom and in such a situation where a heinous enemy like India is busy in conspiracies across the border, and on the other border there is USA along with armies of 24 countries, in such situation this is only ISI which is standing on the battle-front in this war alone, because cold wars are always fought by secret agencies.